1. Convert Type to Outlines: If there is relatively little text in your Illustrator file, we recommend converting text to outlines. This alleviates the need to include fonts with the file. However, this effectively removes the ability to edit text in the file. When converting type to outlines, we recommend retaining a copy of the original version of the file in case edits are required in the future. 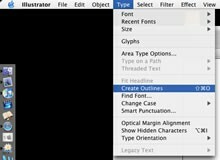 To covert text to outlines, simply select the text in the document, and select the "convert to outlines" option under the 'Type" menu on the main menu bar. 2. 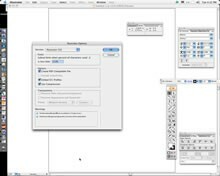 Setting "Save As" options: When saving the final version of your Illustrator file for submission, we recommend selecting "Create PDF compatible file," "Use Compression," and "Embed all Fonts." These options are all selected by default. We recommend un-checking "Subset fonts when less than 100% of the characters are used" which is also selected by default. Once saved with these options, your file is ready to be submitted.